Which ink cartridges do I need for my HP Officejet Pro 8000 Printer Series? For your US HP Officejet Pro 8000 Printer Series you need HP 940 Black (XL) and HP 940 Cyan/Magenta/Yellow cartridges. There are also Combo Packs (4 cartridges in one pack) available, like the HP 940XL Black Ink Cartridge and HP 940 Colors Standard Yield Cartridges Four Color Combo Pack. For your European and UK HP Officejet Pro 8000 Printer Series you need HP 940 Black and HP 940XL Cyan/Magenta/Yellow cartridges. There are also Combo Packs (4 cartridges in one pack) available, like the HP 940XL 4-pack High Yield Black/Cyan/Magenta/Yellow Original Ink Cartridges (C2N93AE). 1. Turn the printer on by pressing the power button. 2. Gently pull open the ink cartridge cover. 3. Remove the ink cartridge that requires replacement by grasping it between your thumb and forefinger and pulling it firmly toward you. 4. Remove the new ink cartridge from its package. Be careful to touch only the plastic on the cartridge. Do NOT touch the electrical contacts and ink port. 5. Align the cartridge with its color-coded slot and insert the cartridge into the slot. Press down firmly on the cartridge to ensure proper contact. It should snap into place. 6. 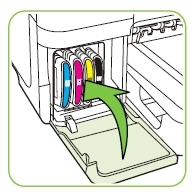 If more than one cartridge is low on ink, repeat the steps to insert the other cartridges. 7. Close the ink cartridge cover. 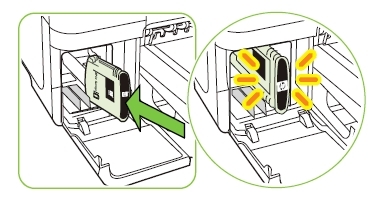 Whenever you replace a printhead, the device automatically aligns the printheads to ensure the best print quality. However, if the appearance of your printed pages indicates that the printheads are misaligned, you can start the alignment process manually. You can align the printhead from the printer’s Control Panel, from the Toolbox (Windows) or HP Utility (OS X), and from the Embedded Web server.